Paul A. Lichtefeld, Sr., born in March 1942, is a native of Louisville, Kentucky. 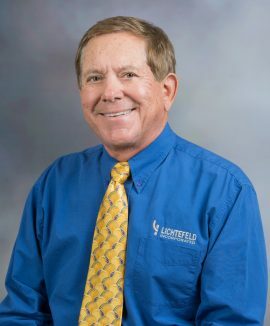 He and his family are committed to Louisville where Mr. Lichtefeld operates a local Design/Build contracting firm and actively contributes to the community. In 1960, Mr. Lichtefeld graduated from Trinity High School, a highly regarded private school. He then studied four years at the Speed Scientific School at the University of Louisville before devoting his energies full-time to his family’s Design/Build contracting business. Mr. Lichtefeld was a member of the Delta Upsilon Fraternity while attending the University of Louisville. Mr. Lichtefeld’s family has enjoyed a long tradition as a Design/Build contractor. His grandfather, Fred J. Lichtefeld, started his Louisville contracting firm in 1918. The company, Fred J. Lichtefeld & Son, General Contractors, specialized in residential construction and commercial buildings. Mr. Lichtefeld’s father, Stanley, ran the contracting firm for many years before handing the company’s reins to Mr. Lichtefeld in 1963. In keeping with family tradition, Mr. Lichtefeld has entered into business with his three grown sons. Paul Lichtefeld, Sr. is president of Lichtefeld, Inc., a Design/Build Contracting firm. He has more than 40 years of experience in total operation of the Construction Company, from Design and Construction to Financial Management. Lichtefeld, Inc. has completed more than $100 million in contracts over the last 10 years. Since 1963, Lichtefeld, Inc. has increased annual sales from $400,000 to 18 million. Over the last five years, Lichtefeld, Inc. has developed more than 2 million square feet of office, warehouse, and retail space in Kentucky and Southern Indiana. Negotiated work comprises approximately 90 percent of Lichtefeld, Inc.'s total volume. Renovation of existing buildings comprises 10 percent of total construction and includes such local historic buildings as the Hart Block, Summers Herman, and The Theatre Building. Since 1974, Paul Lichtefeld, Sr. has been constructing and leasing buildings. Mr. Lichtefeld and partners own more than 1,000,000 square feet of retail, office, and warehouse space. Under Lichtefeld Properties, Mr. Lichtefeld manages the buildings and develops new projects for his portfolio. Lichtefeld, Inc. and Lichtefeld Properties are located in The Breckinridge Tech Center, which is owned by LD Properties, LLC, an affiliate. The Theatre Building, in downtown Louisville, consists of 72,000 square feet of renovated space and is listed with the National Historical Register.